One of my favorite things to grow out on the patio in the summer is citrus. The bright colors and fresh scent make it the perfect backdrop for cookouts and morning coffee. If you live in a warm climate they can stay outside all year long. If you live where it gets cold they need to come inside during the cold weather but make a great addition to your home. Take some time to choose the type of citrus you want to grow. One of the most popular options is the Meyer lemon. In both a regular and dwarf variety this citrus does well in pots and smells amazing when it blossoms and fruits. You can grow limes, oranges, and tangerines easily in posts as well. Look for a dwarf verity that will not get too large to bring into your home in the fall. 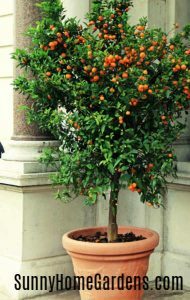 Use a very large pot that you like for your citrus tree. Most varieties will come in a pot that will work for the first season but moving to a large pot when it is time to re-pot will allow you to go long periods between repotting. Choose a pot that fits your personality or decor. There are so many fun planters out now. Fun bright colors are always a great choice for your citrus plants. Choosing the location for your citrus is important. Citrus thrives in the sun and needs to be in full sun as much as possible. This makes your citrus plants the perfect thing to fill in that space on the patio that no one wants to sit because it is always so hot. When the weather turns cool and you need to bring your citrus indoors you may have a struggle finding a winter home for your citrus plants. They need sun even in the winters. Placing them near a south-facing window where the sun will shine in can help but you may need to provide your citrus with more light than is available through a window. This can be accomplished by using a grow light for your citrus plants. Your citrus plants will bloom in the winter while they are indoors. Most likely there won’t be any insects around to help you pollinate. This means you will want to hand pollinate the plants in order to have any fruit grow. You can do this with a small paintbrush and plenty of patience or order a wand designed specifically for pollinating your plants by hand. Citrus can be a hungry plant choice and fertilizer is important to help your citrus plants grow and thrive. You want to avoid fertilizing in the fall and winter to discourage new growth when your plants are not receiving the amount of sun they need to thrive. Instead, start fertilizing during the growing season beginning in March and ending in late August. This will help your citrus grow well without becoming an issue in the long cold winter. When moving your citrus plants indoors or outdoors you may notice a lot of leaves falling. This is a normal part of the process as your plants adjust to the change in light. New leaves will replace the fallen ones so don’t panic even if it seems to be losing a lot of leaves. 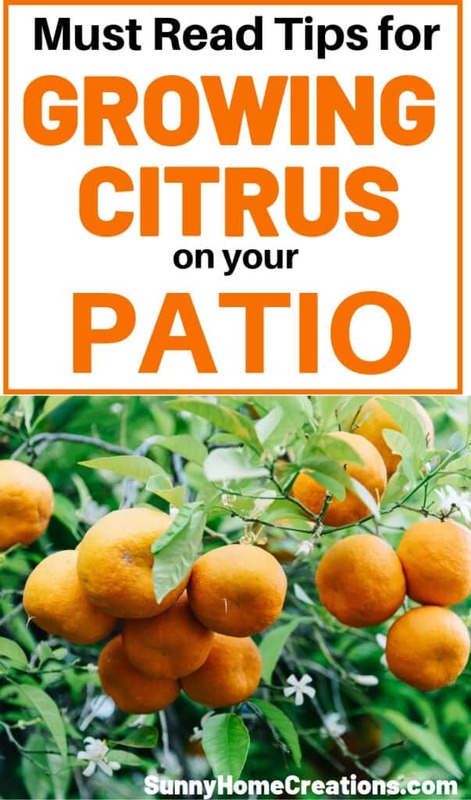 Growing citrus on your patio can be highly rewarding. Particularly if you live in a cooler climate and cannot grow them right in your backyard. The blossoms over the winter are uplifting and a great way to brighten your home and fight seasonal depression. Citrus makes a great houseplant and they are a perfect addition to your patio garden. For the first few years, you will not get a large harvest. Eventually, your harvests will become larger and your patio citrus will become a great addition to your table as well.